In His upside-down kingdom, God promises we can actually find our life by giving it away to others. What is your God-given passion for serving? What is outside of you and bigger than you that demands your time, talent, and treasure? I encourage you to ponder that as you read Jeff’s thoughts in Wrecked. The result will be life changing . . . and you may be surprised to discover that the life changed could be yours. A stunning debut, this book—admittedly—wrecked me. In Wrecked, Jeff Goins held nothing back, using his poetic writing and passion for change-making to call me to action in my own life. He’ll do the same for you. It’s been said, “The true gospel comforts the disturbed and disturbs the comfortable.” Jeff reminds us that Jesus not only came to heal broken hearts—but also to shatter the status quo. Let his book be an invitation to say yes to Jesus and then do something daring with your life. May it help you become a holy nonconformist to all the patterns of this world that are out of sync with the upside-down kingdom of God. May it give you the courage to join the revolutionary work of Jesus, loving people back to life and building a new world in the shell of the old one. Jeff Goins wrote my favorite kind of book. First he lived it, then he wrote it. The result is a book that everyone who has ever wondered “Is there more to life than this?” should read. Although Jeff Goins writes of his experience working with missionaries and ministry, this is truly a guide to growing up and committing to a worthy cause. Yes, young people will find this book immensely practical and helpful, but so will anyone of any age who wants to do work that matters. Perhaps you are like me, at the stage of life where you wonder if you are chasing air and evaluating your overall purpose and impact— this book is also for you. Get Wrecked and walk away changed. Jeff Goins has written an inspiring, instructive, exciting, forceful call for young people. I’d love to give it to almost every twentysomething I know. There is a life that most of us dream of living. Chances are you won’t drift into that life. But there are some clear choices you can make along the way to set yourself up to receive all that God has for you. Jeff does a masterful job of gracefully yet purposely helping us take the steps of faith so many of us need to take. With Wrecked, Jeff Goins goes way beyond a simple call to action. He gives you a manifesto for getting off the sidelines and living the kind of life you’ve only dreamed about. Be warned—Wrecked will change you! This is one of the best books I’ve read in a long time. Jeff Goins is a precise and passionate speaker, which is also true of his writing. No unnecessary verbiage—to the point truth that will change our lives. I like that . . . I like that a lot. Jeff Goins has written a clear-eyed book about the grit and glory of growing up and choosing commitment over complacency. His perspec- tive is refreshing and at times hard to hear, but it brims with practical wisdom for those who yearn to serve a purpose larger than themselves. Wrecked is a book you should be deliciously afraid to read because its content will collide into your conscience and derail your future into a life more meaningful than the one you’ve lived before. Wrecked fulfills two rare deliverables: it messes with you (in a good way), and introduces you to the fantastic writing of a new author you’ll certainly be hearing more from. I’ve read Jeff’s writing for years, and I can tell you: what he talks about, he lives. As someone who has given his life to helping the least and less fortunate, he shares his heartrending experiences and struggles in a voice that resonates. Read this book, but be warned: you won’t finish it the same way you started it. I loved this book. The stories filled me with a desire to be more, risk more, and live more. Who would have guessed that being wrecked is really the beginning to living? If you want to live, get Wrecked—read it, then do it! If you’re someone who is groping in the dark without purpose or inspi- ration, Wrecked just might be the flashlight you need, enabling you to see the next step in the journey. My dreams and goals have all been sideswiped by something much greater than I could muster up in my dream machine of a brain. So many times we chase and run after a dream and dodge the very things that will get us closer to the dream if we would only allow them to. Jeff has taken stories in this book and wrapped practical advice on what to do when life hits the fan. We think it’s over. But it’s only just beginning . . . 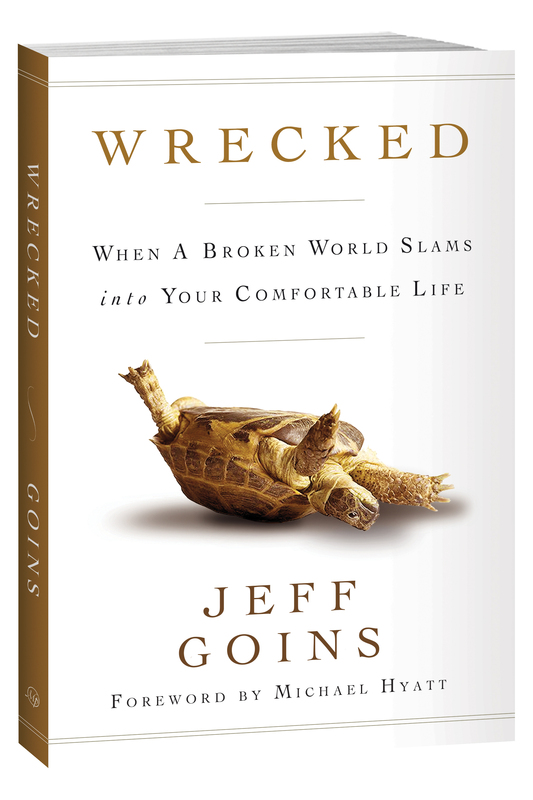 In Wrecked, Jeff Goins emerges as a noteworthy and influential voice for this generation. As great writers do, he frames the pain that accom- panies compassion with words and stories I won’t soon forget. Reader beware: change is coming and Jeff Goins holds the megaphone. Everything Jeff Goins writes is purposeful, fervent, and full of human- ity. The stories and ideas in this book will break you, shape you, and ultimately fill you. If you’re looking to be stirred toward something more, encouraged toward your true calling, and challenged to act accordingly, even when it’s hard, read Wrecked and join the adventure of a lifetime! Wrecked is a creative mix of wit, transparency, and courageous thinking that will catch you off guard and lead you on an unexpected explora- tion into your own soul and calling. Open this book if you dare to live life to the fullest. —Charles Lee, CEO of Ideation, and author, Good Idea. Now What? The compassion Christ calls us to can sometimes break us in ways that completely wreck our former way of living in our comfortable little worlds. Goins challenges readers to live life not only on purpose but with purpose—remembering that none of us gets a second chance at life. If you are ready to make a difference—a real, raw, life-altering dif- ference in the world—then Wrecked is a must-read. Jeff has the rare gift of moving hearts. You’ll find encouragement, be inspired to step out of your comfort zone, and live with purpose. Enjoy the journey. Jeff Goins is one of the freshest writers coming on the scene today. He not only brings a raw, authentic perspective to the issues we struggle with most but also a surprising wisdom that is far beyond his years. Wrecked is a must-read because if you haven’t been, you will be. And this book is for such a time as this. In a world that teaches us to spend our lives building hollow monu- ments to our comfort and success, the message of Wrecked rings true: we must allow our monuments to be knocked down in order to make way for something that will endure. Wrecked is a guide down a beauti- ful, broken road, and I’m grateful for it. Wrecked is one of those books that had me continually saying yes under my breath. Jeff is a great writer whose engaging storytelling resonated deeply with me at every turn of the page. He was able to put in 150 pages the transformational journey we all wrestle with early in life. As a therapist and pastor, this is exactly the type of book I can’t wait to put in the hands of the people I counsel and minister to. This life we live isn’t meant to be comfortable and easy. We’ll all experi- ence and encounter situations that will challenge us to look at the world differently. How we respond will determine the kind of impact we leave. Wrecked will inspire anyone who desires to do more with their life. In our story-centered culture we’ve learned that personal growth often comes through pain, struggle, and conflict, but we’re still drawn to com- fort over calamity. Through his own story of being wrecked, Jeff Goins leads us into a calling of giving our lives away for the sake of God being able to use us for His glory. Wrecked is the challenging book needed for upcoming generations looking to find their place in our world. Through the years, I’ve mentored many young men, but few of them have taken direction like Jeff Goins. His maturity and commitment are exemplary; he is years ahead of his peers. The writing in this book reflects that—a heart of humility and passion and a life that lives it. We’re all creatures of habit. We want life to go as planned. Predictable. Neat. Tidy. If that’s what you really want, put this book down and walk away. Because Jeff’s powerful stories and profound insights will scrape the scales from your eyes and shift your focus outward to a suffering world. The grip on your perfect personal reality will slip, because Wrecked will inject it with awareness, compassion, and room for others. Prepare to have your heart dislocated—for the better. I better warn you. This book is not going to leave you alone. It hasn’t left me alone, even when I wished it would. Jeff writes true things, with heart and integrity, and that’s what gets under my skin and into my soul and makes everything get all, well, wrecked. This is the kind of book that people remember reading because it coincides with making big choices. Bravo to Jeff for living it first and then writing it well. Wrecked is not your typical book about brokenness. Jeff’s writing is deep and poignant. He has written a guide to the life most of us are too timid to live—the one in-between the thrills and adventures. This book will force you to think differently; it did for me. Through brilliant storytelling, Jeff captures the heart and soul of those who will not be satisfied with watching others help others. They want to make their days count. In the pages of Wrecked, I found a new iden- tity for myself. I want to be wrecked. When you read this book, you will, too. What Jeff talks about in Wrecked is more than mere theory. As a twentysomething who has dedicated his life to serving a purpose bigger than himself, he shares the greatest opportunity his generation faces: the opportunity to make a difference. This is a book written from the trenches, and is real and relevant to the real world. This book will cause you to take a long overdue look in the mirror. Mired in complacency? Prone to selfish behavior? Yeah, me neither—or so I thought until I read Wrecked. Jeff Goins will equip you with the practical steps needed to do something about it. If you’re ready to be challenged, read it now. If you’re comfortable where you are, read it anyway. For some of us, we try so hard to avoid pain in our lives that we avoid making the right choices. We choose to reject God’s guidance because we value how we feel more than we value the future God has for us. In Wrecked, Jeff reminds us that the struggles we are facing may be the direct results of our prayers for something better in our life.